Overview :Application for notifying you of name days, birthdays and other dates with unique features and amazing customization options. 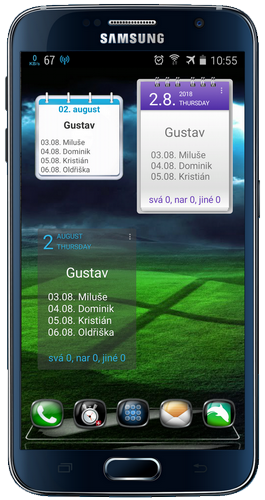 - meaning and characteristics of Slovak first names from base SK calendar, for Czech names the application can show meaning and characteristics of the Slovak equivalents. You can add you own meaning and characteristics of all first names. - a unique function "Not found contacts" is included. 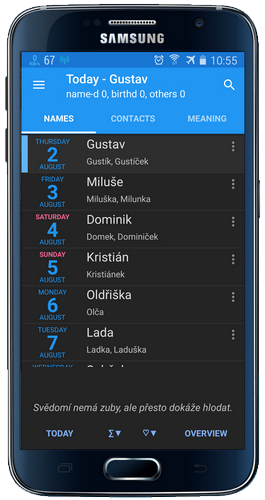 The application searches for the contacts which it cannot find name days for. By adding an alias or added name it solves the problem. - predefined wishes (in Slovak, Czech, English ang German language). You can add your own wishes. - sending wishes by text message, email or chat. 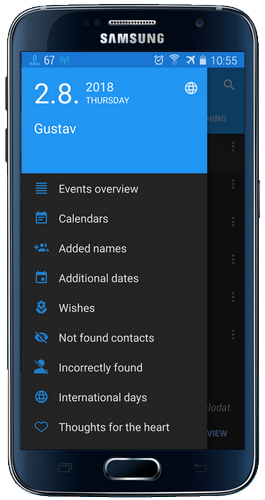 You can directly call the contact or create a calendar event. - thoughts for the heart (quotations). They are displayed on tab NAMES and new configurable widget. - in a header of the day in the Events widget there can be displayed a day of the week and a text "(in X days)"